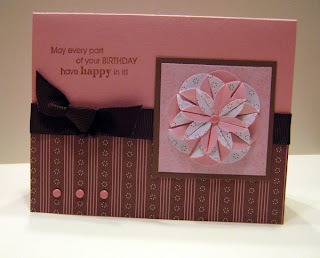 Do you have any cards that you have made and just can't give away? Here's one of mine. 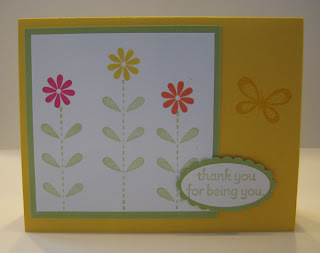 But I actually gave it away yesterday to a friend who stamps with me. I had to be sure my card was one she had never seen so I went to my box and pulled out this Dahlia Fold card. I did a display board of dahlia folds for a demonstration I did a couple of years ago, and this was one of my favorites. Visit this post for directions. 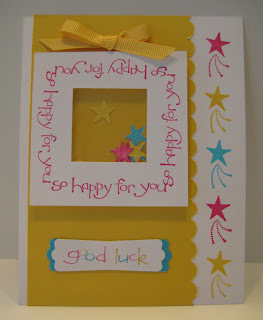 Last summer at our annual convention, one of the cute ideas demonstrated on the main stage was this card idea. There was a cute name for it too, but I can't remember that. Since then I have wanted to do one of these in my stamp club, but not until Sale-a-bration did I get the So Green stamp set - and it was free! 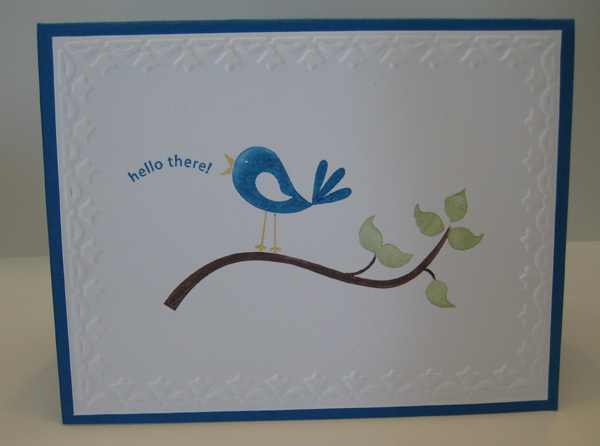 The front of the card could be anything, but I wanted to go with something all-purpose and used the Cheep Talk bird. We also used the Framed Tulips Impressions folder. 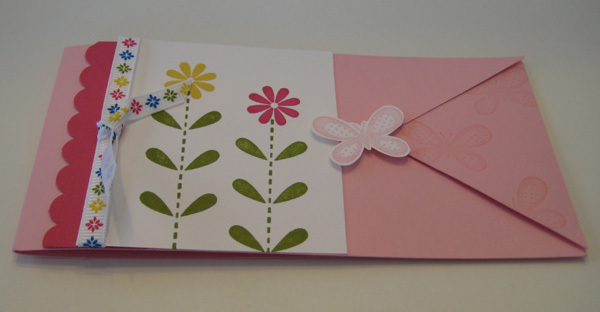 But the cool part of this card is the 3 x 3 envelope on the inside of the card. 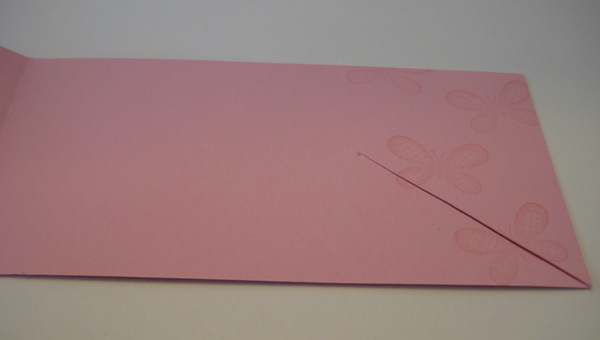 Stamp your greeting, sign your name and leave a fresh card inside so your recipient can reuse your card. Now could you do this without the So Green stamp set? Of course, but it is just the right touch to make sure everyone understands what to do. For years, I have been putting my personal message on a post-it note for some people, but it often required an explanation. 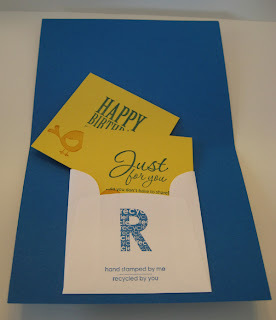 Now all I have to do is stamp "hand stamped by me ... recycled by you" and then it's pretty clear. 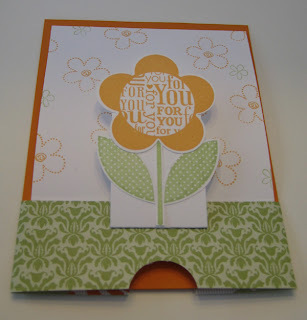 Here's one of our recent stamp club projects. 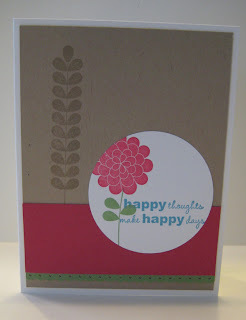 This fun fold was demonstrated at the Stampin' Up! leadership convention, and the great demonstrators in our group who attended came back and taught us this an much more! Start with a 3 x 12 piece of cardstock. 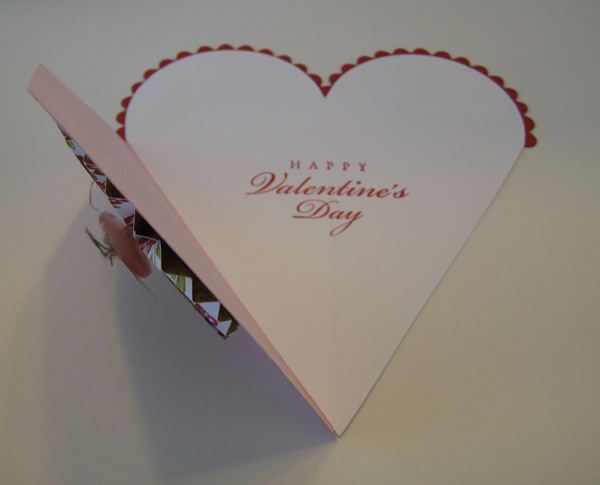 Make a diagonal cut from the bottom corner up on the back side of the card. Make a diagonal cut from the top corner down on the front piece. 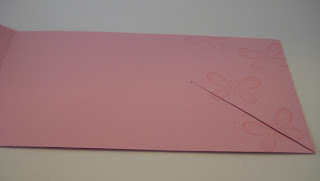 The best way to find a meeting spot for the two cuts is to use your paper piercer to poke the hole. Then make the cuts from there. I used Bold Blossom and the free Sale-a-bration ribbon from the Ribbon & Button pack to finish off the card. Let me know if you would like to take advantage of Sale-a-bration and get some free goodies too! 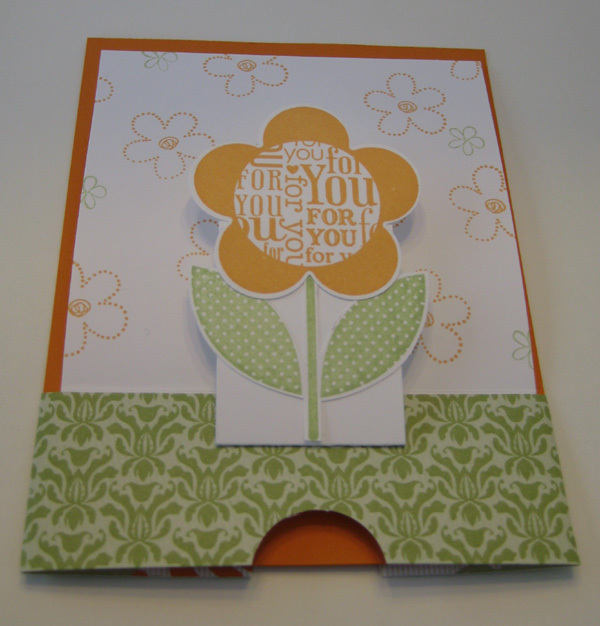 This was made with the new petal cone die from the Occasions Mini catalog. I used Eat Chocolate for the stamping and used marker to ink just the chocolate bar and topped it off with a few Hershey Kisses (which are long gone now)! Tonight was our last night for this round of scrapbook club. Let me know if you would like to join us for a new round. Here was tonight's layout featuring products from the Sale-a-bration flyer. Happy Valentine's Day! This might be my favorite project from stamp club last week. 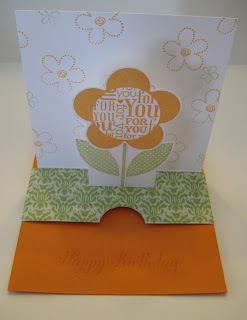 I ordered the new petal cone die from the Occasions Mini Catalog and wanted to find some other uses for it besides just petal cones (stay tuned - I have a petal cone to post soon). Well how about a heart? 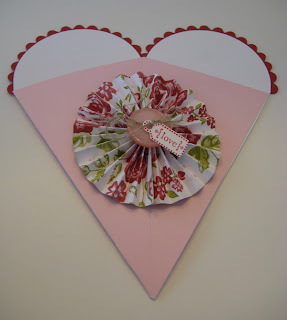 With two cut out shapes you can make a card like I did, or attach them and make a pouch to slide a little treat into. 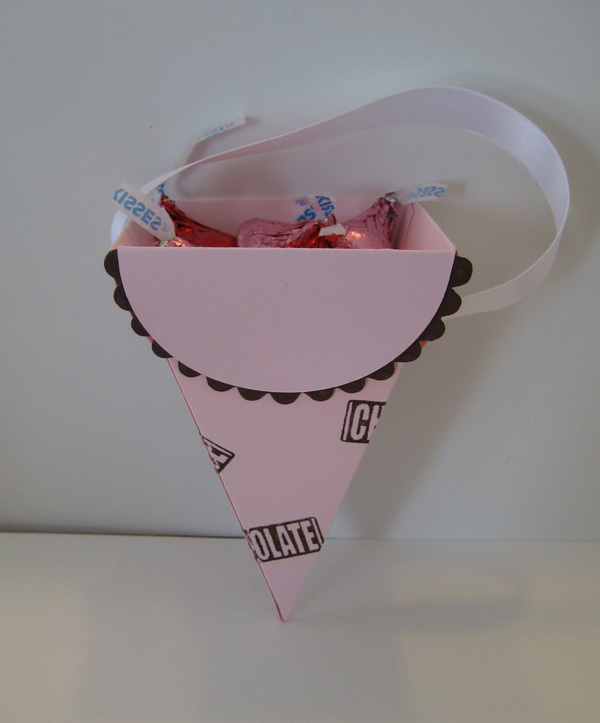 It does still have the crease in the center because it is designed to be folded into a cone. No problem - cover it with a big flower of some kind. And it was a perfect opportunity to make the accordion fold flower Darleen had asked me about. There was nothing difficult about the flower. When I was designing the project, I eventually got smart and took the whole sheet of Designer Series Paper and scored it at one time.... then I cut the strips. So that took a lot of the work out of the additional flowers I made and for the club ladies. This flower was made with a 1 1/2 x 12 strip scored at 1/4 inch. After folding it, attach the ends like you are making a bracelet, flatten out the circle and stick it down. I used a circle of sticky pages because I didn't want that thing to budge. 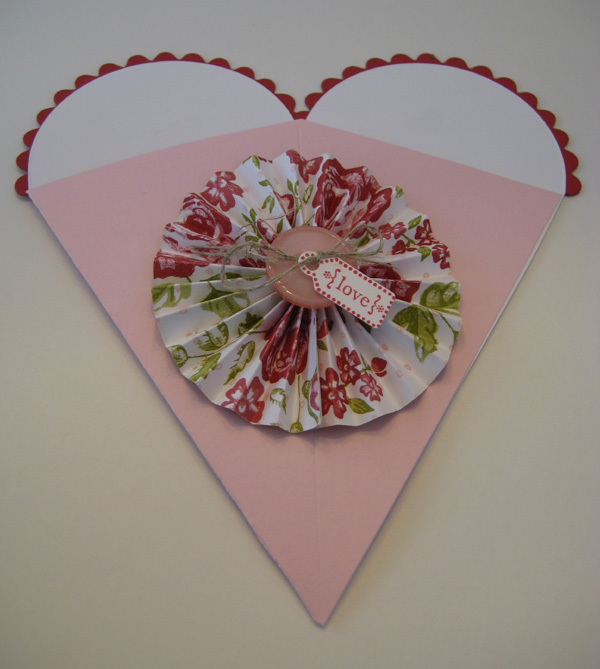 I used retired Designer Series Paper for the flower because it had Pink Pirouette and Riding Hood Red in it, and I was trying to mix up my Valentine colors a little for those ladies who attend multiple events. 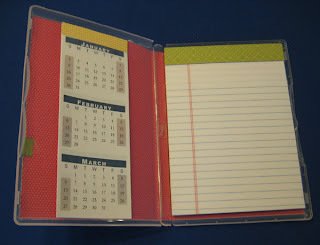 We used buttons from the Holiday Mini and attached them with a glue dot wadded into the hole of the accordion fold. 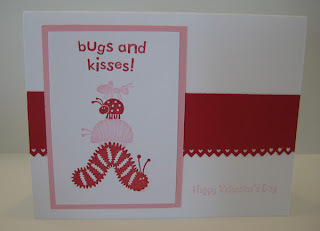 And too keep with the retired theme, I used my all-time favorite Valentine's Day stamp. The tag was made with Tiny Tags and the matching punch. It was a nice way to finish off the card and gave the ladies other options besides "love" for their tag. Here is the Bugs and Kisses card I made for my niece. I started out planning to give this one to my nephew since it was a bug card, but I decided it was too pink and she would like it much more. 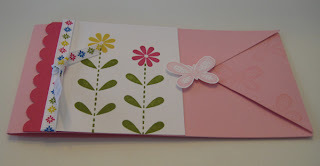 I have learned to put the cards I send to my niece and nephew in the same envelope. Because even though I mail them on the same day, they don't always arrive together. So to eliminate any problems, I have started putting them in the same envelope. I don't know who gets to open the 1 envelope, but that seems to be a better plan than one getting mail and the other child not getting anything from Aunt Rachel. So here's my nephew's card this year. 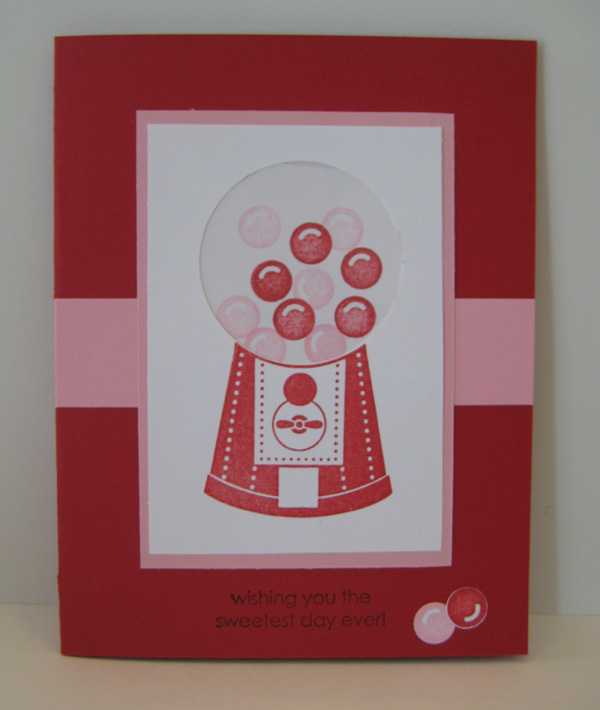 I put a window sheet behind the cut out circle so it does have more of a gumball machine look in real life. Isn't this fantastic? My friend and downline, Rae Anne, made this for me for Christmas. 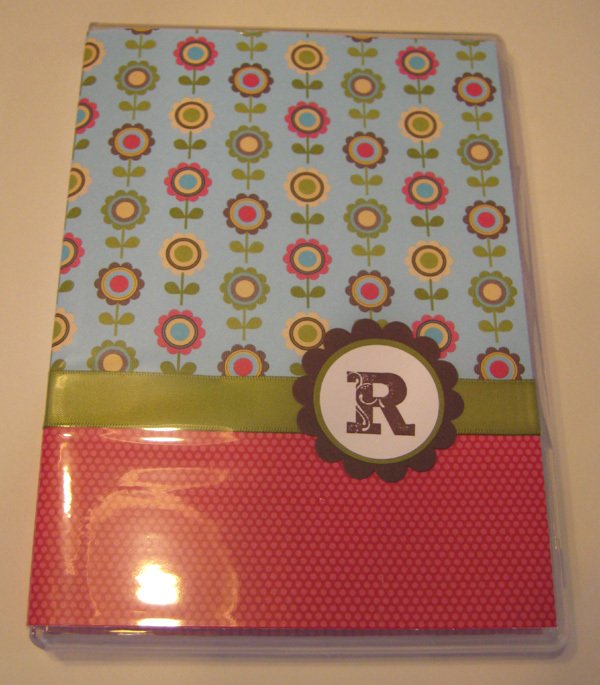 She knows me well and used my favorite Designer Series Paper, Play Date, to create this notebook out of an empty stamp case. Here are some others she made for her co-workers. The only problem I have is that it's too cute to use! 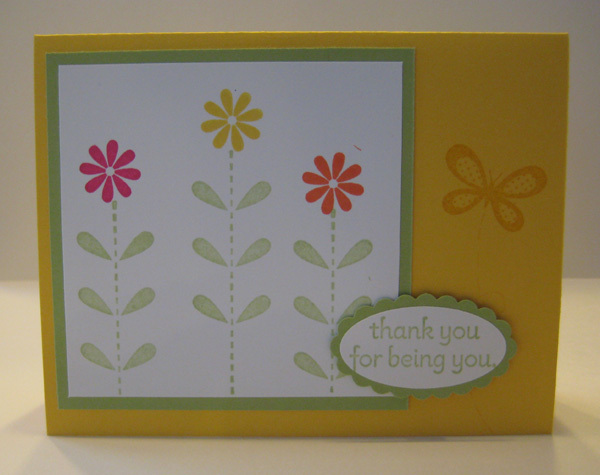 This is the last of our 3 cards from last weekend's stamp-a-stack. I designed this thinking it could work for most anyone. I got all of my Valentine's Day words out, and one of the ladies even made hers into a birthday card. Here's a slightly different version of the card we are doing this weekend. I am kind of in the pattern of making more than one but changing it slightly. Here's another version of a card I posted a week or two ago. This change is bigger and changes the card entirely. Click here to see the original. It's funny that although I know the baby is coming and even an arrival date, I often am scrambling for a baby card when the time comes. 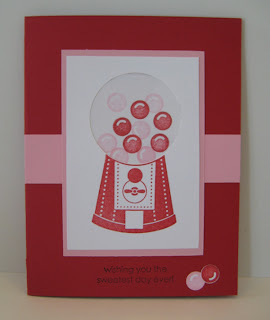 So as a part of my stamp-a-stacks, I try to include baby cards at least once a year. But how do you know what to make? Well we take care of that and make one of each! I recently participated in a Sale-a-bration swap with demonstrators in my upline's group, and boy did I get some great cards! For my card, I used So Happy for You and made it into a shaker card. I created the "frame" with words from the set and then covered the opening with a window sheet. I outlined the opening with thick foam tape (non-SU) and filled the center with stars. Don't use too many or they will somehow pile up, get too thick and get stuck! Midway through this swap, I was regretting the decision to cut all of those little stars, but the 1/2 inch circle punch helped move things along. It took all of the outside off and then I just cut little Vs around. I have a friend who will be getting a new job soon and thought this would be a perfect card! A friend of mine just had her third baby girl so I thought this would make a cute card for the family. It uses the Level 1 hostess set, A Slice of Life, from the occasions mini catalog. 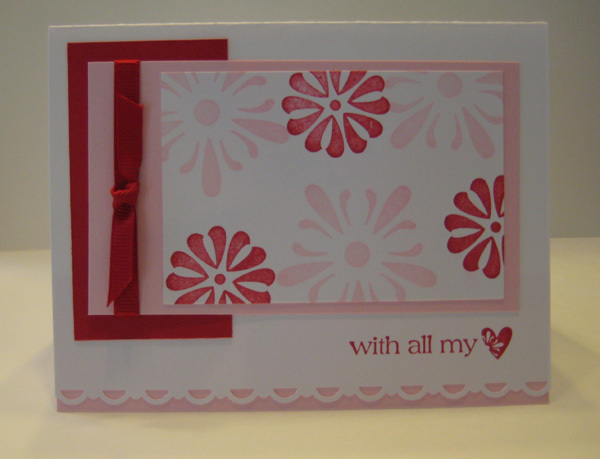 It also uses the new Framed Tulips Textured Impressions Embossing Folder which is just perfect for a simple card like this one. Check back, we will be using this same stamp and embossing folder for baby cards this weekend at my stamp-a-stacks.